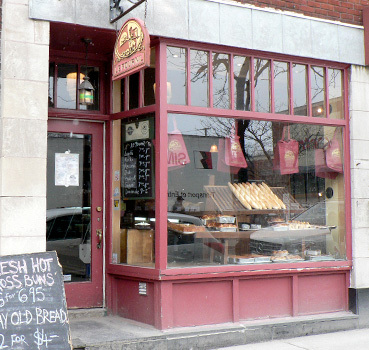 Located in the heart of Westmount’s Victoria Village, Le Fournil surely qualifies as an authentic Artisinal Bakery; everything is made on the premises. We use a variety of natural products and organically grown grains for the baking of our bread and making our delicious and decadent desserts. Le Fournil prides itself in entirely baking its bread and all other products the old fashioned way: with a lot of TLC and never cutting corners. The three sisters of Le Fournil; Robyn, Tawn, and Chelsea, were looking for an opportunity to work as a group…to build something special together. They heard of a cute little place for sale in Westmount and thought, why not give it a try?! Robyn has embraced the role of head baker thanks to her incredible skills in patisserie and as a Chef, Tawn is on the move every day taking care of the business aspects and Chelsea specializes in cake decoration and event planning. Between their parents and their own families, these three sisters have truly made this bakery a “sweet and savoury” family affair! Read more about them as featured in the Westmount Examiner!